Tuesday, Feb. 16 -At 2pm, a six member delegation of SDS-Student/Farmworker Alliance(SFA) met with two ARAMARK corporate executives and two local operation managers: Robert Dennill (Vice President of Corporate Social Responsibility), Rick Martella (C.V.P of Corporate Affairs), Bill Zemba ( Resident district manager), and Terry Stevens (Vice President of Florida Higher Education Sales), respectively. The meeting went as expected-nothing productive was accomplished and the truth was obfuscated. The officials tried to pacify the delegation though rhetoric with claims of "working with the Coalition of Immokalee Workers (CIW)." All we offered to these suits was our promise to fight against the racist exploitation of farmworkers and we made it clear that we won't be satisfied until there is justice for farmworkers. SDS and SFA protest Aramark, escalate immediately. 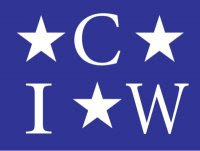 Today (2/10/10) members of SDS/SFA were scheduled to meet with an Aramark representative regarding the demands of the CIW but it was canceled at the last minute. Aramark decided to jerk around the CIW last week so the campaign against them is escalating nationally. Seeing how they were doing the samething to us we decided to escalate our tactics immediately by turning a cancelled meeting into a rally and protest in the Reitz Union! Around 35 people showed up to confront Aramark about cancelling the meeting. We decided to keep our end the deal and hold the meeting at Terry Stevens office. His secretary accepted our letter on his behalf after we read to the staff a list of our demands. We then told them that if they did not meet them, we would act accordingly. We did so immediately by walking up the stairs and chanting "No more slaves! Pay a living wage!" 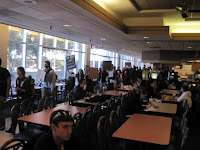 We got the attention of all the students eating lunch in the Reitz Union, and told them who we are and how Aramark refused to meet the demands of the CIW. We then walked around the Reitz Union chanting. 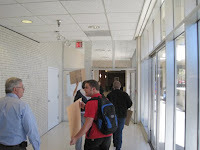 Employees of the Reitz Union tried to stop several of us but, knowing our rights, we ignored them and continued our protest. Several students joined us in chanting and the march around the Reitz union. Several more came up to us to learn more about our cause and we invited them to come to our meetings. The Alligator and the Gainesville Sun were also there, so expect some more updates tomorrow with links to their stories. SDS & SFA fight for farmworker rights!!! Students are putting pressure on the University of Florida’s primary food provider to raise wages for farm workers. UF students want Aramark to meet with the Coalition of Immokalee Workers to consider a one-cent raise for every pound of tomatoes picked by workers. UF’s Student Senate passed a resolution in October supporting the effort. An Aramark official scheduled a meeting Wednesday on campus with the students before canceling, said Jose Soto, a doctoral student in food and resource economics who is part of the effort. The group still plans on meeting at 11 a.m. at the Reitz Union Amphitheatre to rally and try to force a meeting, he said. “We want to tell Aramark that we plan to escalate our campaign,” he said. The coalition has previously been successful in getting Burger King and other fast-food chains to boost wages for workers, although a growers’ association has prevented its members from implementing the increases. In one of the most hostile cities toward homeless, SDS and Muslims make a difference. 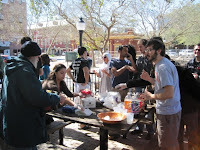 On Saturday, February 6th, Gainesville SDS teamed up with the local Muslim organization Project Downtown to serve a free meal to the less fortunate in the Gainesville Community. SDS members met on Friday night and cooked a nutritious meal of chicken casserole and fried rice. 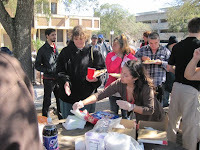 On Saturday at 1pm in the downtown Bo Diddley Plaza, SDS and PD members worked together to serve more than 40 people lunch. Gainesville, ranked the 5th meanest U.S. city for homeless by the National Coalition for the Homeless, is notoriously pro-business and anti-homeless. The City government has pursued anti-homeless tactics ranging from prohibiting "pedestrians from receiving money from motorists" to imposing limits on the number of meals the St. Francis House can serve a day. The National Coalition for the Homeless report can be found here. 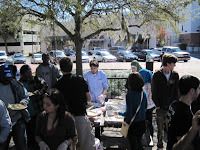 Project Downtown Gainesville is a local community service organization, based on Islamic principles and inspired by the national Project Downtown initiative, that contributes to the well-being of the greater Gainesville community by providing necessary services to its homeless, indigent, and disadvantaged members while fostering a positive image of Islam through cooperative social work and outreach. 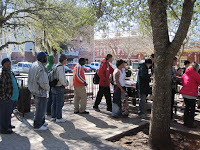 Gainesville SDS plans to work with Project Downtown to serve more meals in the future. The following minutes were taken at our Feb 1st meeting, and additional notes from the trip some SDSers made to Scott Camil's house follow. C. NO SMOKING @ Scott’s house!!! B. Feeding 60 people – lots of cooking! A. @ Immokalee, free sweatshirts! Scott Camil has been a veteran anti-war activist for over 40 years. He has agreed to let us use his house as a base for making some pinback buttons and T-Shirts for SDS. We hope the pinback buttons and the T-Shirts help promote unity in SDS, make our presence in future actions and protests more visible, and generate a small surplus of cash that will be used towards activist supplies. We are going to start this project on Friday, February 12th. Contact GainesvilleSDS@gmail.com for more info. Workers are fenced off from the site of the Duval County Courthouse building project where they were once promised jobs, but that doesn't stop them from protesting this unjust treatment from Turner. Jacksonville, FL - Over 200 supporters of Jobs for Jacksonville rallied to protest Turner Construction's unjust and unlawful labor practices, Jan. 26. Union members from the Carpenters, IBEW, Boilermakers, Sheet Metal Workers and the Teamsters are waging a campaign against Turner Construction. Turner refuses to hire out-of-work construction workers in Jacksonville for the Duval County Courthouse building project. This is a blatant breach of Turner Construction's contract, which promised to provide many jobs for the economically hurting building trades people in Jacksonville. After the workers rallied at the construction site, they marched over to Jacksonville's City Hall chanting, “Mayor Peyton sold us out, Turner get the hell out!” They rallied one more time on the steps of City Hall before flooding the City Council Chambers with red shirts reading “Jobs for Jacksonville!” During the meeting of the Jacksonville City Council, workers from many backgrounds and nationalities spoke, denouncing the council's failure to take action against Turner's breach of contract and threatening to return to the chambers with hundreds more if justice did not prevail and the workers' right to jobs was not respected, as per the contract that managers of Turner Construction signed. The workers were joined by members of Gainesville Area Students for a Democratic Society, who traveled to Jacksonville to support them. The students came armed with demands that money go towards building jobs and education, not wars and occupation. When asked for the reason why he supported the rally, SDS member Jared Hamil replied, “These workers work harder than most, aren't given a living wage and are the first to lose their jobs during an economic recession. To not support these workers would mean turning your back on people who are struggling for the same things we're all fighting for. Companies like Turner Construction want to divide people so they can get rich while we fight each other. That's why students and workers should support each other in their struggles." While some of the workers present at the rally were led by the managers of Turner Construction to believe that it was immigrant labor that kept them from being hired for the building project, leaders of the rally were quick to point out that unions should organize workers of all nationalities if they wanted to win and be treated with respect by companies like Turner Construction. If there was a problem getting jobs, then it was a problem the bosses created, not other workers, leaders of the rally said. John Parker, President of the Sheet Metal Workers Union Local #435 in Jacksonville, proposed that unions should organize all workers regardless if they are immigrants, because that's the only way to make sure the bosses hire people fairly and pay a living wage to everybody. Overall, the rally proved how powerful workers can be once they band together. The workers of Jacksonville are one step closer to justice because of it. 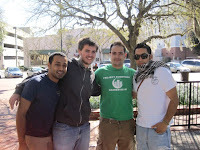 Welcome to the blog of the Gainesville, FL branch of Students for a Democratic Society. 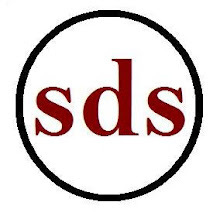 Generally this blog will provide information on upcoming events, summaries and reflections on past actions, and political analysis by SDS members. Anyone can comment so make sure to leave feedback.